"Thanks so much for all your help and kindness. Much Appreciated!" The Sheraton Steamboat Resort Golf Course development began in the summer of 1972. By the summer of 1974, this Robert Trent Jones II designed course was ready for play, with Tom Watson as its PGA tour representative professional. On the fairways and greens, you play in the presence of history - across alpine meadows, past a stonebuilt dairy barn, along Walton Creek under the watchful majesty of Steamboat´s great peaks. To play at Catamount Ranch & Club is to learn something entirely new about the heart of the game. Haymaker is an 18-hole championship golf course designed by Keith Foster, and features a full practice facility, pro shop and the Haybale Bar & Grill. Haymaker is located three miles east of Steamboat Springs, Colorado at the junction of U.S. Highway 40 and State Highway 131. 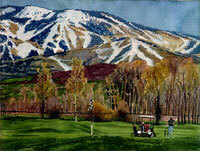 Founded in 1964, the Steamboat Golf Club is the oldest established golf course in the valley. 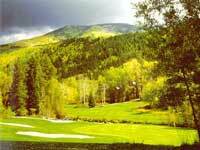 The 9 hole course borders the Yampa River featuring beautiful views of the valley and Steamboat ski mountain. The brand new club house facility is now open, featuring a full bar with mixed drinks, cold beer, and food. The Steamboat Golf Club is family oriented and affordable.